The race Aug. 18 will promote bicycling. FREDERICK, Md. – Frederick Mayor Randy McClement was pretty excited talking about the city hosting the only penny-farthing race in the U.S. But wait a minute. 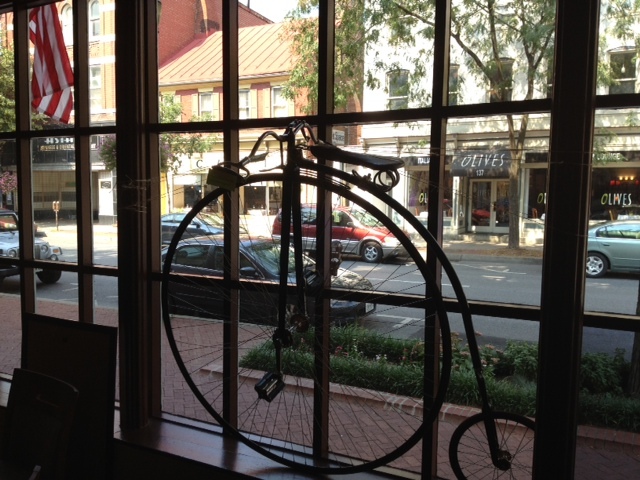 What the heck is a penny-farthing? It’s basically a bicycle with a very large front wheel and a very tiny back wheel and was created in Great Britain in the late 19th century. I’m a bike rider myself, and I find this bike very intimidating to try to get on. The race will start at 4 p.m. Aug. 18 in front of Brewer’s Alley. From there, racers will circle around city hall and return to Brewer’s Alley. Frederick is hosting this race to promote bicycling and the city’s bike-friendly nature. Some of you might find a high-wheel bike race kind of silly. Three-time Tour de France winner Greg Lemond doesn’t think so. He is scheduled to ride with the other participants. The only questions I have about this race is this: If the bikes are authentic, whether antique or replicas, do you ride them with bicycle pants or go with 19th century garb? I just don’t know, but it should be fun for all to see. Follow David and WTOP on Twitter.